This photo below was scanned from a Japanese sports magazine "Sports Graphic Number" of 25 April 1996. It's from the Division Playoffs between the Atlanta Braves and the San Francisco Giants in Atlanta. The batter is Fred McGriff of the Braves. Where in the photo is the baseball which has just left McGriff's bat? 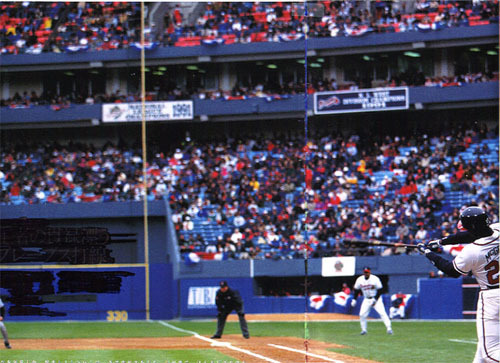 (Note: Since this photo was scanned from a magazine, the vertical line halfway between the umpire in black outfit and the coach in the white is the crease in the original page of the magazine. We were not able to smooth out that line, but it does not interfere with where the baseball can be found.) To find the baseball, you have to project mentally the flight of the ball after it flies off the thick end of McGriff's bat. The music which is playing is the most popular song in baseball, "Take Me Out to the Ballgame." For the answer to where we think the baseball is, scroll down a few lines below. .To highlight where the baseball is, we have darkened the background of the cropped photo so that the white baseball shows up clearly. 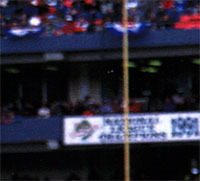 It is located slightly to the left of the foul line post, in the upper deck just above the flag banner.
. X the baseball is about one centimeter just below the spot marked by the "X"
After all this, you might wonder, what the hell does this have to do with anything? I did too, until I thought about the process of looking for that baseball against the background of a sea of people in different coloured shirts, and I thought, how similar that process was to trying to locate a needle in a haystack, or trying to sort out a business problem buried in a sea of uncertain conditions, or trying to decide where was the opening, in the sea of life, to the road to fulfillment and contentment. To find that baseball, you might try looking for clues in the direction that the umpire (in the dark outfit) and the coach (in the white uniform) are looking, but unfortunately, their reactions are delayed, and their natural tendency to follow the flight of the ball doesn't take hold until later. So that's no help, in the same way, that trying to detect clues from the reaction of others to real life problems may not be of much help. But by observing what clues are available, and with a little guess work, the answer may be found. In the photo, you might try to project from the angle of the bat, the flight that the ball might take, and then look for a white mass that doesn't seem to fit the background of the photo , and with a bit of luck, you may find the ball, and hence, the answer. Life is like that. So what started as a lark, in placing an interesting photo on this page, turned out to have serendipitous results. (The word serendipity means the fact of something good happening quite by accident, and not intended.) Life often works out that way.